This type of page is great for presenting information in rows and columns, such as product information, menus, events, pricelists, etc. As tables can include weblinks to other websites, they are an easy way to build a links page. The table is fully configurable for the number of rows/columns and their formatting, with a maximum of 10 columns and 150 rows. 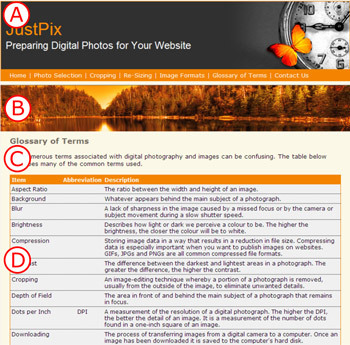 The example below shows a 3-column table (D) following on from a short introduction contained in the Header (C), which follows the Masthead (A) and Banner picture (B).